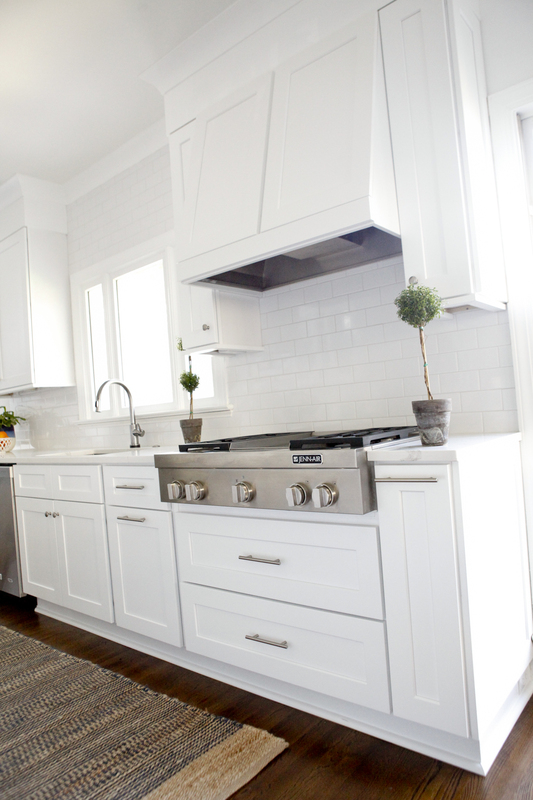 Selecting appliances for our new kitchen was one of the more exciting (and overwhelming) decisions when it came to our renovation. I had an idea of what I wanted but spent hours upon hours researching options, brands and features. I have no idea why we thought this was a good idea at the time, but given that Matt and I both had Labor Day off work, we decided to spend the day knocking out our appliance shopping all at once. I should also mention our kids had the day off as well…and came with us. Have you ever been appliance shopping with a 3 and 4 year old? Well, I don’t recommend it. Anyway, we had already done lots of research online but wanted to see some of the finalists in person so we decided to shop at Queen City Audio Video Appliances at the recommendation of our contractor and lots of local friends. We specifically asked for Big Mike, our amazing sales rep who was so patient with our wild kids and guided us through the entire process. I had previously negotiated a Wolf range ahead of our shopping trip with Matt (see: kegerator section). While Wolf is an excellent, excellent brand, Big Mike asked me a few questions to understand why I was so certain this was the range for us. You know, questions like “What is your culinary style? What cooking methods do you use most? What number of BTUs did we desire?” When I responded with…”Well, we love to cook pancakes and bacon on the weekends. I guess we use high heat (??) for boiling water for spaghetti noodles. My style is one pan skillet meals? Did I answer everything?” Of course Big Mike was happy to sell us this cooktop, but because he is a really good sales rep, he asked if we would be willing to see the JennAir cooktop in the section two steps away. Honestly, I wasn’t too familiar with JennAir, but was willing to hear him out. And I’m glad I did because it turns out this cooktop had everything (and more) that we needed for our cooking style at a much better price point. I was blown away by the professional quality, classic finishes and powerful and precise burners (one 20,000 stacked BTU power burner for flash flying, two 15,000 BTUs and one 5,000 BTU simmer burner). Additionally, I was able to upgrade to the 36″ pro-style cooktop (which makes a huge difference when using several burners at the same time) and add in a high-performance chrome griddle — perfect for those aforementioned pancakes…and still come in under budget! We also purchased a Ventahood stainless steel hood insert which is quiet and easy to clean. We’ve been using our cooktop for almost 5 months now and love it so much. The most popular questions I’m asked are how often we actually use our griddle and how easy is it to clean. 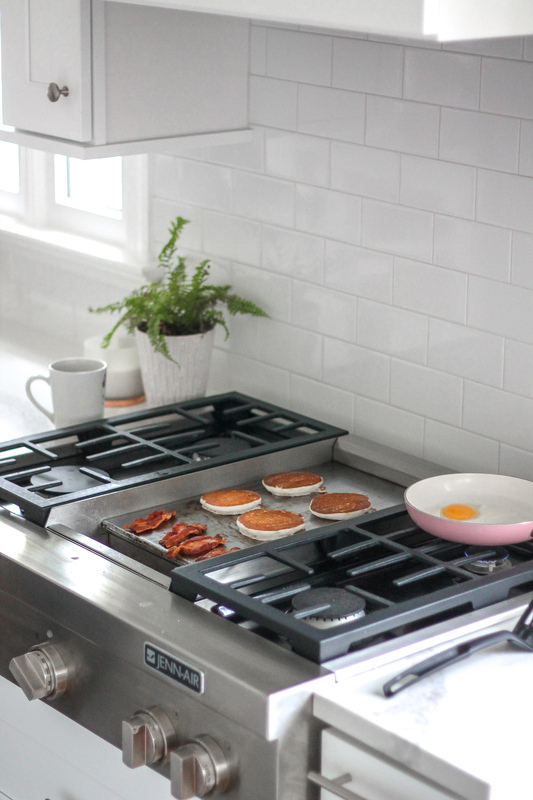 We use our griddle constantly — especially on the weekends for scrambled eggs, pancakes, bacon, etc. To clean the griddle, we turn the heat up to 400 degrees and then pour a cup of water along the back and let it drain into the grease trap, then we use a sponge to wipe it down. However, the cleaning effort really depends on what we’re cooking — bacon seems to require the most effort, but hasn’t stopped us from cooking it on the griddle. 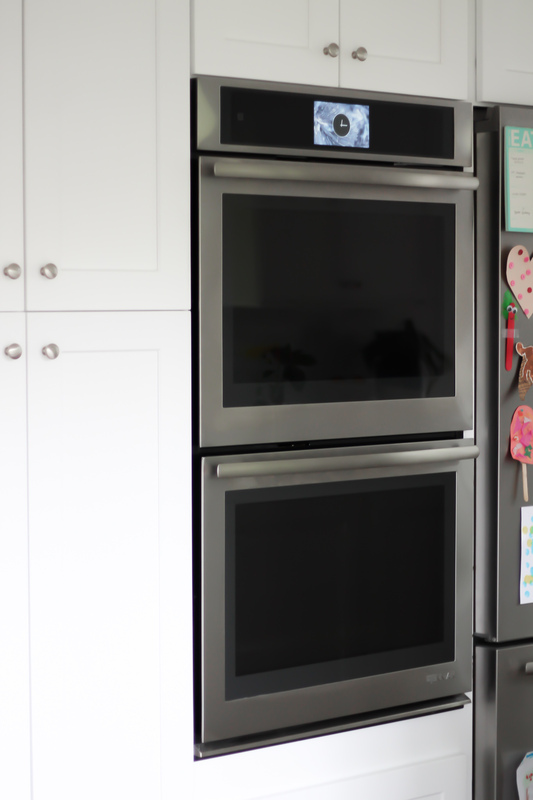 We designed our entire kitchen around two things: 1. a massive island and 2. double wall ovens. We had a lot to learn here and wandered around the store looking at all the options before ultimately landing back in the JennAir section and picking the 30″ Double Wall Ovens. Using my leftover savings from the cooktop, I splurged on the upgraded model with the dual-fan convection system (two vertically placed fans for even cooking on all racks) and Culinary Center, one of the biggest features that sets JennAir apart from the competition. 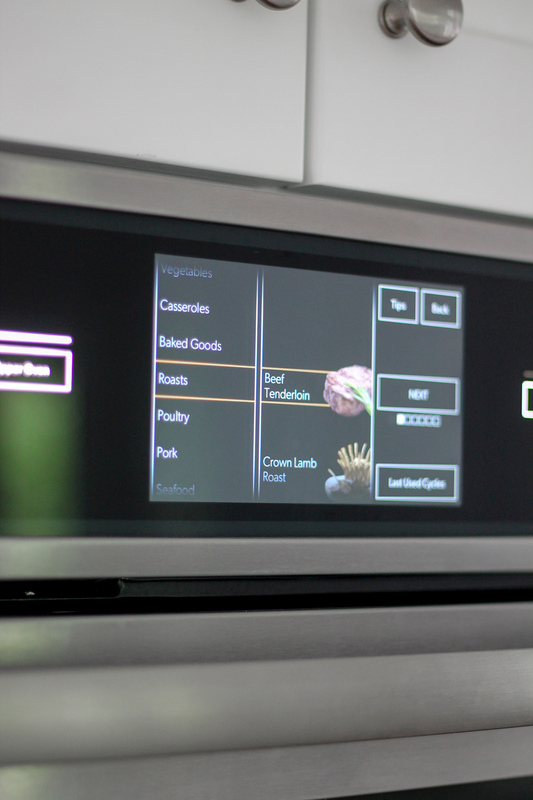 Accessible through the 7″ LCD full color touch screen, the Culinary Center offers customized cooking based on what and how you’re cooking, pan types, doneness levels and more. You can also store up to 25 of your favorite recipes using the My Creations feature in the program. This model includes so many other amazing features too like soft-close doors, telescoping glide rack (absolutely incredible), no-preheat mode and my most used feature of all…Wi-Fi connectivity so I can remotely preheat the oven on my way home from work or check on cooking status while sitting on our patio outside — all through an app! 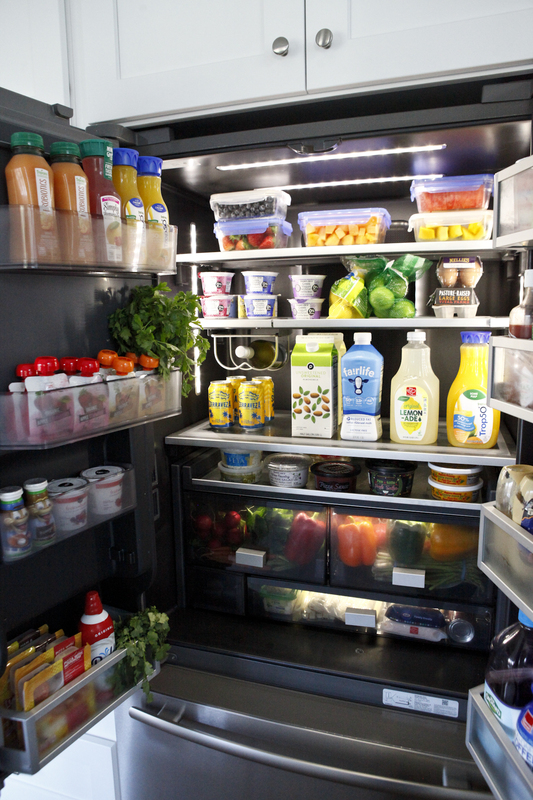 Selecting the fridge was actually the hardest decision for us as we were really picky about some of the features we wanted like counter depth, french doors with bottom freezer, external water dispenser, in-door ice machine and easy to find repairmen in the future. Basically, we wanted a unicorn fridge. I spent an insane amount of time researching and reading reviews on refrigerators and thought we were going to go with a Samsung until I polled y’all and received so much useful feedback, warnings and advice. 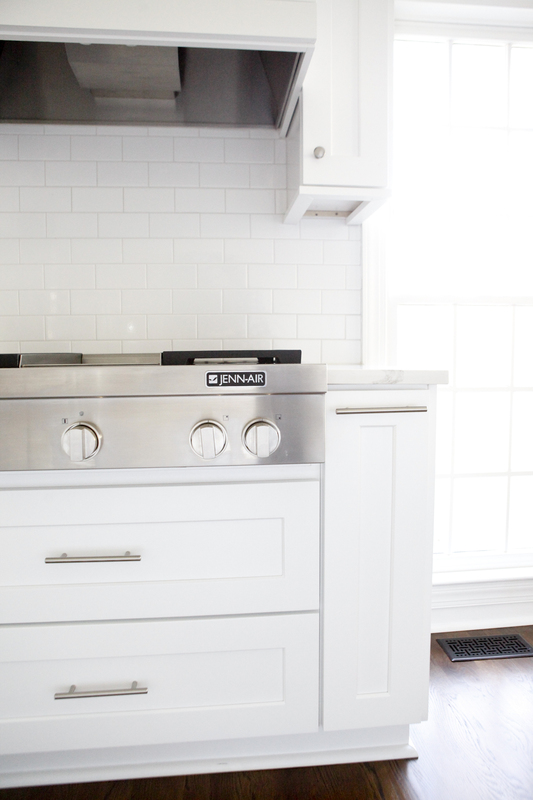 We ended up going with a third JennAir appliance because it fit all of our requirements and there was a $1500 off promotion with the purchase of 3 JennAir appliances. Due to the popularity of this fridge, it took us over 3 months to receive it after we ordered it — and I can understand why. The design of this fridge is really unique. 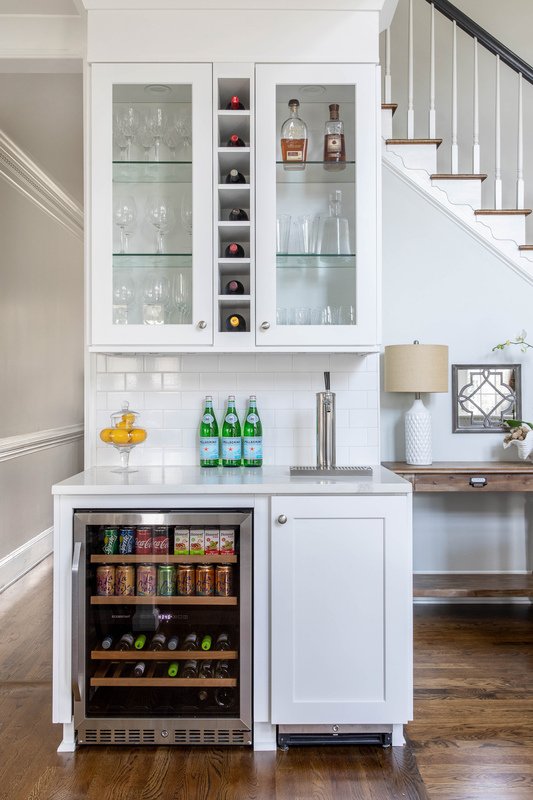 I absolutely love the obsidian interior, LED lighting, adjustable glass shelves including a glass roll-away shelf (this is one of my favorite features), gallon door storage bins and the measured fill feature is life changing. Also, I have to talk about the ice. The in-door ice maker makes the best crunchy ice that doesn’t freeze up or stick together. I also love the in-door ice storage bin for easy ice retrieval without taking up precious fridge or freezer space. Speaking of space, while the design of the refrigerator offers a ton of space, I find the bottom freezer (which features multiple layers of storage bins and trays) to be a little tight so we use the garage freezer for items we don’t need quick access to. 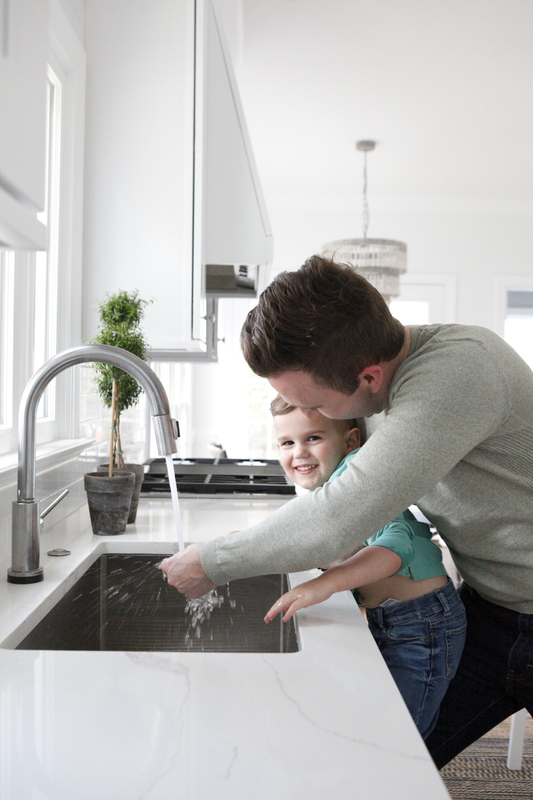 We went with a single basin stainless steel sink and we absolutely LOVE it. No longer do I have to try and clean extra large items halfway hanging out of the sink — this one is huge and amazing. It also comes with a stainless steel grid which I have to mention because I’ve had so many people ask me about it when they see it in my sink. 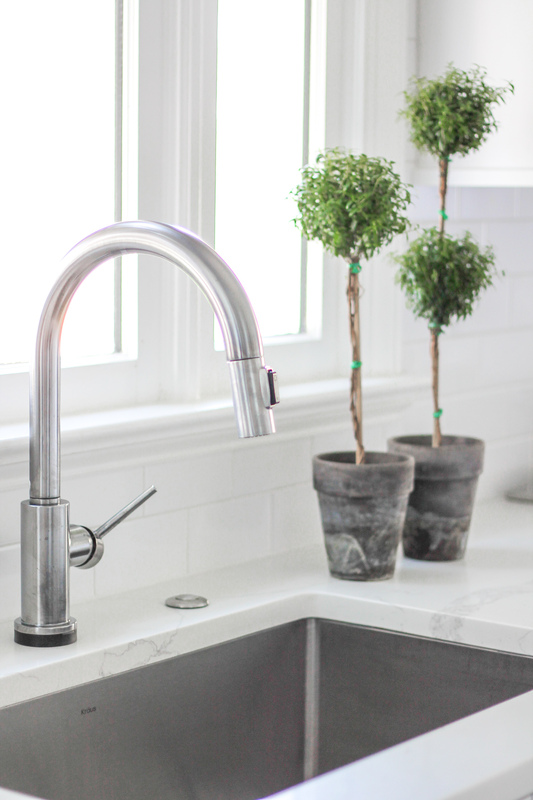 The faucet is one of my favorite features in the entire kitchen. It’s touchless which is such a dream. And now I find myself touching other faucets around the house out of habit. We also bought a power supply pack so we don’t ever have to worry about the faucet running out of battery. During the design process Matt requested that we swap out the sink in our wet bar for a kegerator so he could enjoy his favorite beers on tap. I am pretty sure I laughed for a solid two minutes before I realized he was not kidding. First I said no. Then I suggested the garage would be a better place for a keg. The ultimate negotiator, Matt got clever and proposed I could pick out all of the appliances I wanted for the kitchen if in exchange I allowed the beer tap. Well played, Matt. Well played. And to be honest, I have enjoyed beer on tap just as much as him…and also got my dream of double wall ovens. So it was a win-win. 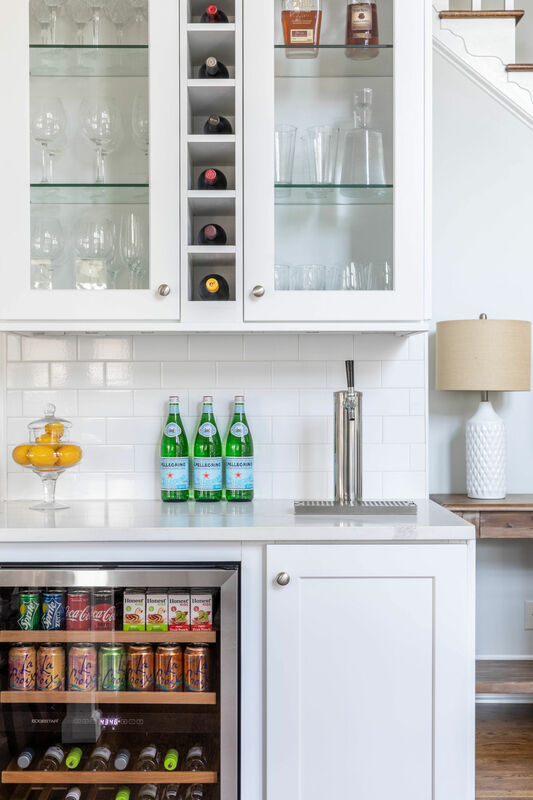 Additionally, we installed a built-in beverage cooler that has dual-temps so we can store juice boxes, sodas and wine! Thank you to Queen City Audio Video Appliances and JennAir for partnering with me to make my kitchen appliance dreams come true! To be completely transparent, I want to note that this partnership was formed after all of our selections were made and these opinions are truly my own! 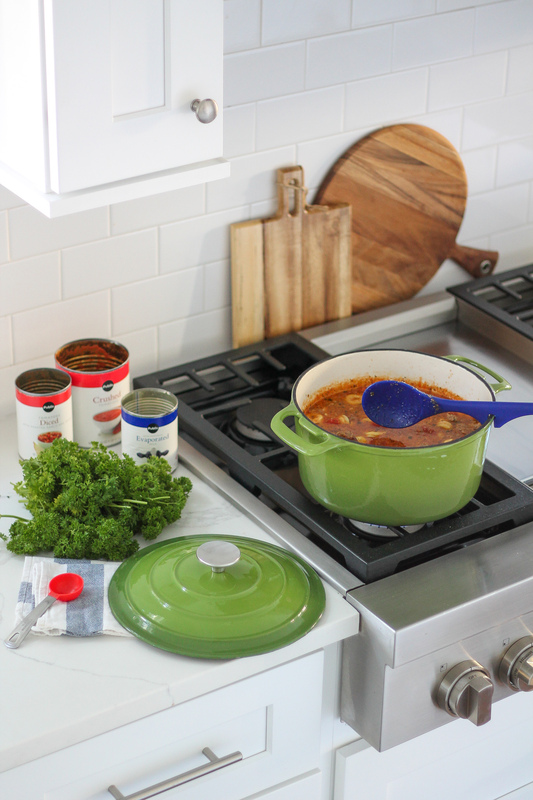 I’m also excited to share that JennAir is offering Carolina Charm readers a free cookware set ($899 value) with a qualifying JennAir kitchen purchase from Queen City. I have this set and it is the best cookware ever! 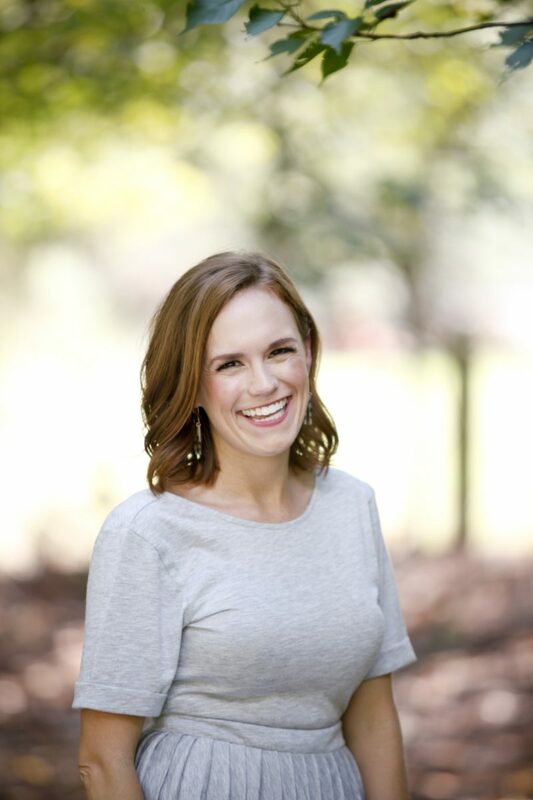 Just be sure to mention code “Jenn Cookware” to your specialist or show them this page! 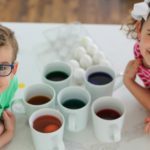 Next Post Five on Good Friday! Love Love Love your kitchen!! 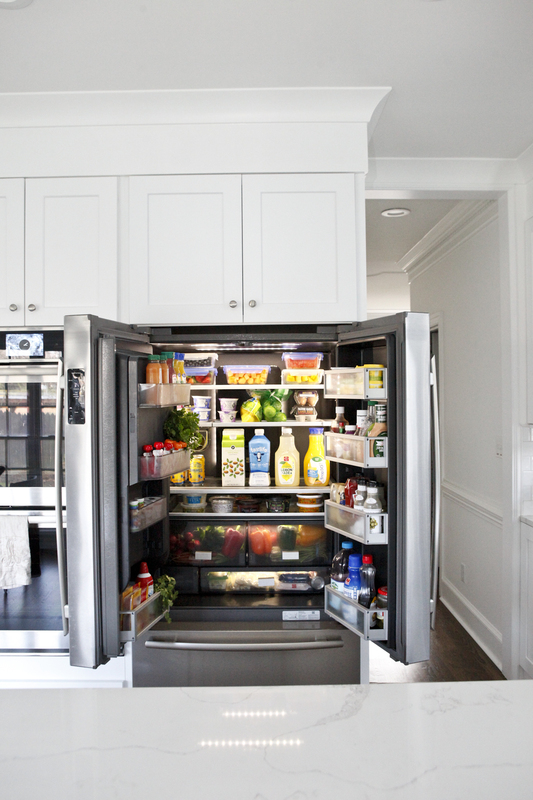 Question, how do you keep your stainless steel appliances clean??? I have a stainless cook-top, oven and fridge and I feel like there are always streaks and smudges! I’m not sure if you’ve tried them before but Weimar makes awesome stainless steel wipes. I love them and one wipe usually does the job for all appliances! 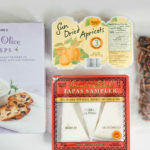 ohhhh, i want to try these! 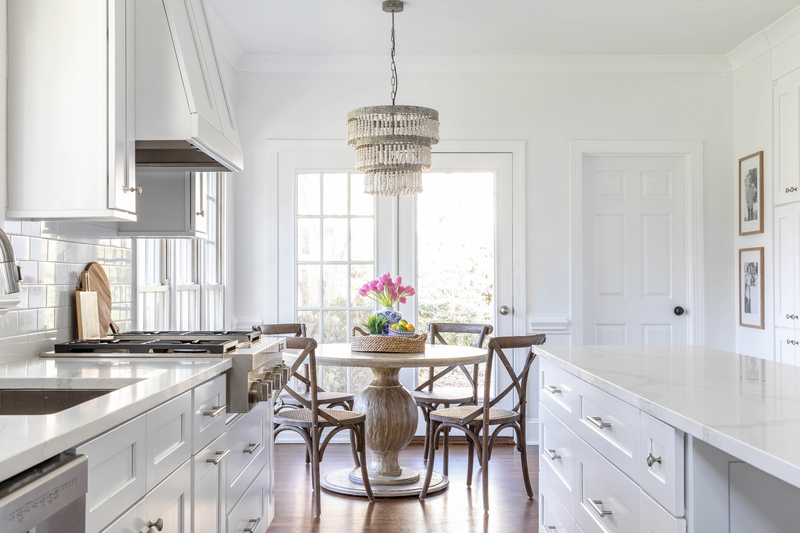 I love everything about your kitchen! That fridge is what dreams are made of!! thank you so much friend!!!! 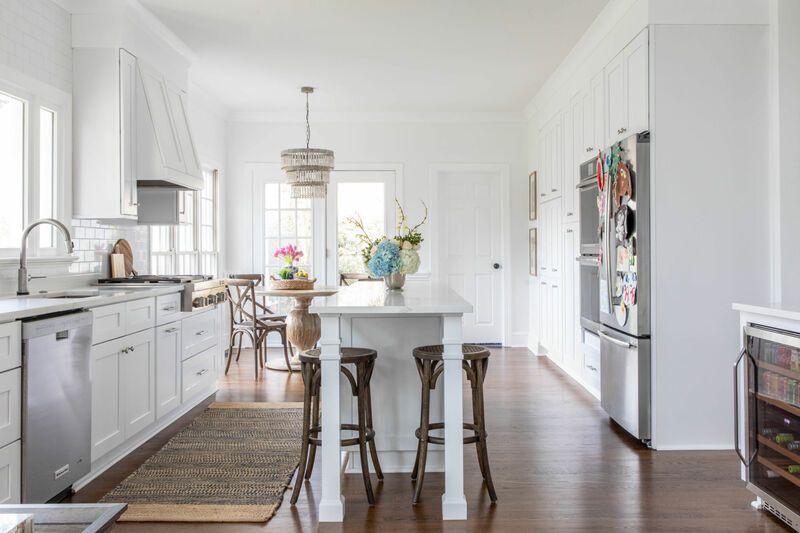 I die over your kitchen every time it’s on the blog! Your post was right on time! We are moving to Florida 🙂 from the DC area in June and redoing a kitchen. I was just trying to decide what kitchen sink to pick and will definitely be going with the single large sink now, makes much more sense. 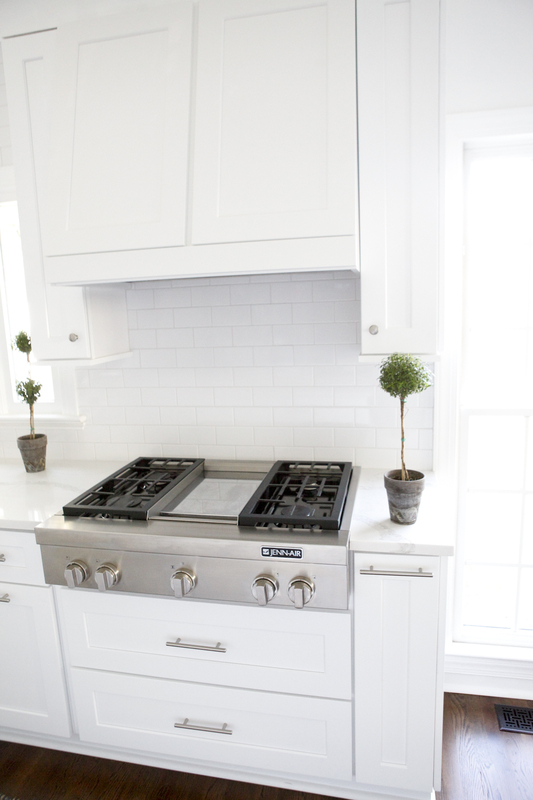 We already decided to go with JennAir cooktops. Love your blog, always full of good ideas and inspiration. Happy Easter! so exciting!!!! you are going to LOVE having a ginormous single basin sink. It’s SO useful. Good luck with your move!!! Happy Easter!